Ten years ago on February 1, the space shuttle Columbia disintegrated upon reentry only 16 minutes before its scheduled landing, killing all seven crew members on board. Among the seven was Israeli Air Force Col. Ilan Ramon, a payload specialist on the mission, and the first Israeli in space. His family's tragic history led him to take reminders of the Holocaust with him into space, as well as hope for his people. Ramon was born Ilan Wolferman on June 20, 1954 in Ramat Gan, Israel. His father's family had fled to Israel from Germany in 1935 to avoid Nazi persecution. His mother and grandmother were Auschwitz survivors from Poland who came to Israel in 1949. Ramon's grandfather and other family members had died in concentration camps. After graduating from high school in 1972, Ramon became a fighter pilot in the Israeli Air Force (it was there that he changed his surname). Ramon attended F-16 training at Hill Air Force Base, Utah in 1980, as the Israeli Air Force established its first F-16 Squadron. He graduated from Tel Aviv University in 1987 with a Bachelor of Science degree in computer engineering and electronics. Ramon was selected as a payload specialist in 1997 and began his training in 1998 at Johnson Space Center in Houston, Texas. The Columbia mission was his first space flight. The mission, STS-107, launched on January 16, 2003 and lasted 16 days, during which time the crew conducted nearly 80 experiments. Ramon, being Jewish, was the first astronaut to request kosher food aboard a space flight. He also had to grapple with the question of how to observe the Sabbath, when a day lasted only 90 minutes. On board Columbia, Ramon carried with him a copy of a drawing called "Moon Landscape" that was sketched by 16-year old Petr Ginz, who died in Auschwitz in 1944. It was a picture of the Earth the way Ginz imagined it would look if viewed from the Moon. Although the copy was lost, the original sketch is in the Yad Vashem Museum. Ramon keenly felt the significance of his going into space. In an interview, he said, "Being the first Israeli astronaut, I feel I am representing all Jews and all Israelis." He talked about speaking to Holocaust survivors after he was chosen to go into space. "They look at you as a dream that they could have never dreamed of," he said. Just as tragedy befell Ramon's family in the Holocaust before he was born, tragedy also struck after his death. One of his four children, his 21-year-old son Asaf, died in 2009 during a routine training flight while piloting an F-16A, three months after graduating from flight school at the top of his class. 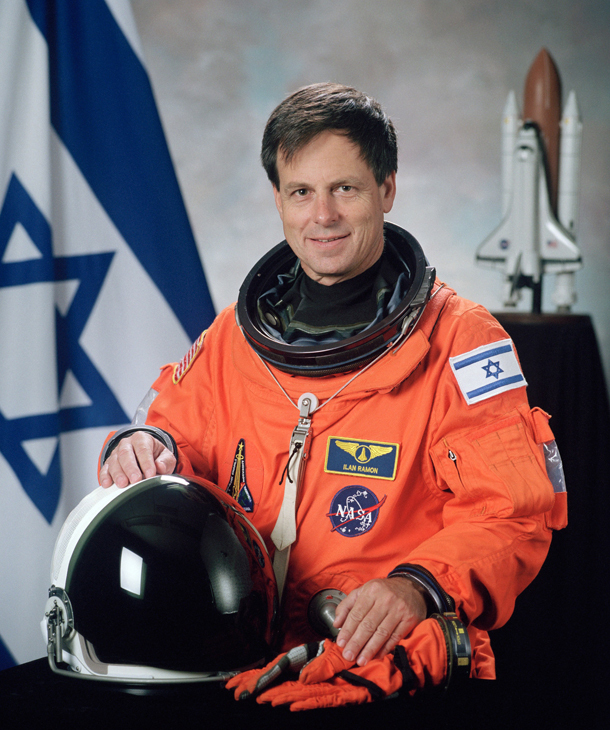 Ilan Ramon is the only foreigner to receive the United States Congressional Space Medal of Honor. Miraculously, 37 pages of the diary Ramon kept while in space survived the fiery explosion, a 38-mile trip to earth, and exposure to wind, sun and rain. His last entry said, "I have become a man who lives and works in space." He is also one of the few to be honored as one who died there as well.